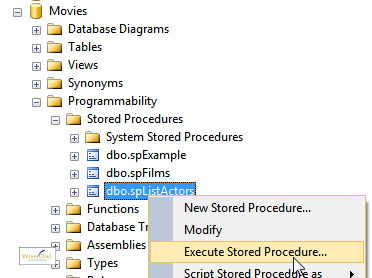 You now want to run the spListActors stored procedure, to list out its contents. Below are 3 ways to do this. 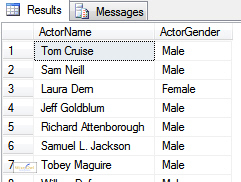 Just double-click on the name of the stored procedure to select it, and then execute it like any other SQL query. The first few rows returned by running the procedure. Note that this method doesn't work if your stored procedure takes parameters (then again, we haven't covered parameters yet!). Right-click on the name of the procedure in SQL Server Management Studio and choose to execute it as shown here. Again, this method doesn't work well if your stored procedure takes parameters. As the above examples show, you can abbreviate EXECUTE to EXEC or - under certain circumstances - miss it out altogether.